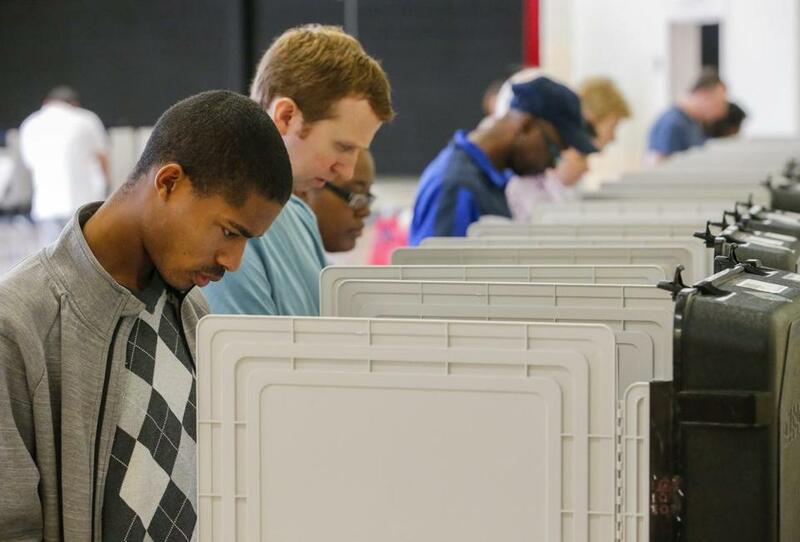 Residents voted on Monday at a recreation center in Tucker, Ga. It was the first day of early voting in the state. WASHINGTON — Civil rights activists are warning that Donald Trump’s unsubstantiated claims of widespread voter fraud in inner cities are really a thinly veiled racist attack, and are accusing him of injecting another incendiary element into an election that is already the most negative and divisive in modern history. On the heels of encouraging his mostly white suburban and rural supporters to monitor polls in “other communities,” especially Philadelphia, where whites are the minority, Trump on Monday sent out a series of tweets warning of election cheats. “Of course there is large scale voter fraud happening on and before election day. Why do Republican leaders deny what is going on? So naive!” Trump wrote, part of his multipronged strategy to portray the election as “rigged’’ as part of a global conspiracy. Trump’s running mate, Governor Mike Pence of Indiana, encouraged supporters at a rally in Ohio Monday to volunteer as poll watchers. RELATED: Are conservative Christians turning their backs on Donald Trump? Specialists say actual instances of vote fraud are extremely rare in the United States. When discrepancies do occur, they are often unintentional or the result of human error — not deliberate malfeasance. Black and Hispanic community leaders in Philadelphia are reacting to Trump’s rhetoric with trepidation, likening Trump’s encouragement of voter intimidation to Nazi Germany. “That sort of tactic is reminiscent of 1930s Germany. It’s very frightening, and not the America that you are taught about in school,” said Angel Ortiz, a former Philadelphia city councilman who is a Democratic political activist and Puerto Rican community leader. In preparation for potential chaos at the polls, the NAACP and other groups have mobilized dozens of lawyers to protect voter rights in about 30 counties, Muhammad said. In some cases, his remarks may have an opposite effect, mobilizing minority voters to cast a ballot against him. “It is vital that our democratic process not be hijacked, and as a campaign we will remain vigilant in ensuring a high level of integrity,” said Jason Miller, a Trump spokesman. Even though voter fraud has proved to be extremely rare, multiple Republican-controlled legislatures across the country have passed laws aimed at curbing it by requiring voters to present photo identification at the polls. A strong focus on voter fraud from the top of the ticket in a presidential election is unprecedented. Trump also is calling on more states to pass laws requiring photo identification to vote. His detractors say Trump’s broader goal is to energize his base of white voters while also using intimidation to suppress the vote in minority communities. Pennsylvania is a prime target for such a strategy because it is a swing state with large cities as well as numerous rural counties, and it has become ground zero for the debate. Despite Trump’s repeated calls for his Pennsylvania supporters to “watch other communities because we don’t want this election stolen from us,” it is illegal in that state for citizens to monitor elections outside of their home counties. The state Legislature is considering a bill that would allow poll watchers to be bused in from other counties. Trump and his campaign have also repeatedly raised questions about the validity of the 2012 election in dozens of inner-city Philadelphia precincts that voted exclusively for President Obama over Mitt Romney, the former Massachusetts governor. Former New York mayor Rudolph Giuliani, a key Trump surrogate, on Sunday implied that minorities living in the inner cities were more likely to commit voter fraud. Newt Gingrich, a former House speaker, also singled out Philadelphia. “To suggest that we have, you don’t have theft in Philadelphia is to deny reality,” Gingrich said on ABC’s “This Week” on Sunday. ‘‘People that have died 10 years ago are still voting. Illegal immigrants are voting,’’ he said. Various studies on the subject have uncovered relatively few cases of voter fraud and nothing even remotely approaching a scale large enough to influence election outcomes. Justin Levitt, a professor at Loyola Law School in Los Angeles who is on leave to work in the Civil Rights Division of the Department of Justice, found only 31 instances of alleged voter fraud between 2000 and 2014, a time period when more than 1 billion ballots were cast. The cases including voting under someone else’s name and votes cast in the name of someone who has died. Trump “has no evidence to support what he’s saying,” said Lorraine Minnite, a political science professor at Rutgers who wrote a book in 2010 called the “The Myth of Voter Fraud” and has testified as an expert witness in several lawsuits involving state voter ID laws. Following a 2013 Supreme Court decision overturning parts of the 1965 Voting Rights Act, a key civil-rights era law, the Department of Justice has slashed the number of federal election observers deployed to communities with a history of discriminating against minority voters. “It leaves some communities more vulnerable this election cycle,” many of which are located in the Deep South, said Kristen Clarke, president and executive director of the Lawyers’ Committee for Civil Rights Under Law. Her group leads the Election Protection Program, a nonpartisan voter protection program that provides a nationwide hotline manned with volunteer lawyers for voters to call with concerns. They also plan to send 2,500 “grassroots” volunteers to 27 states to field questions at polling sites and look for irregularities, up from 22 states in 2012. Tracy Jan can be reached at tracy.jan@globe.com. Follow her on Twitter @TracyJan. Victoria McGrane can be reached at victoria.mcgrane@globe.com. Follow her on Twitter @vgmac.